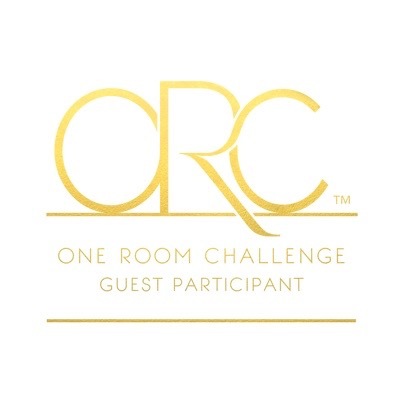 First, I want to thank you for the incredible amount of support and kindness you have shown me here and on Instagram during my first week of the One Room Challenge. You are the ones who are keeping me going into the wee hours of the morning! Now, let’s begin with a reminder of my plan. I can’t wait for this to come together. You can see my full Week One post here. I have already made a few changes to the plan, but I haven’t finalized them yet, so stay tuned! As of last week, I selected my paint and have begun the process of giving the walls a crisp, fresh look. 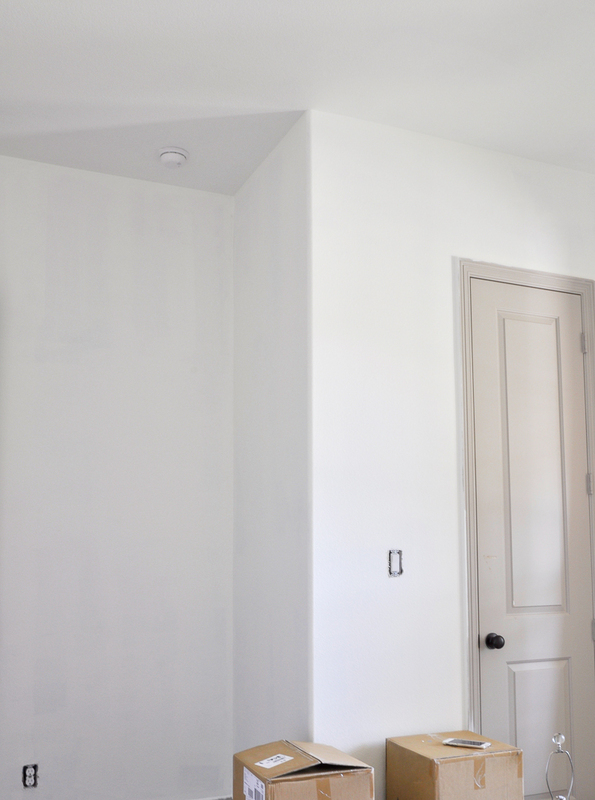 My plan was to paint the room, including the trim molding and doors, Simply White by Benjamin Moore. We made the plan to paint in the afternoon. But, when my sweet hubby went to pick up the paint at 3:00 pm on Saturday to find the Benjamin Moore store closed had closed at 2:30, we had to move to Plan B. Don’t let us down Home Depot! Could they match it? You bet they could! Just like that we were back in business. 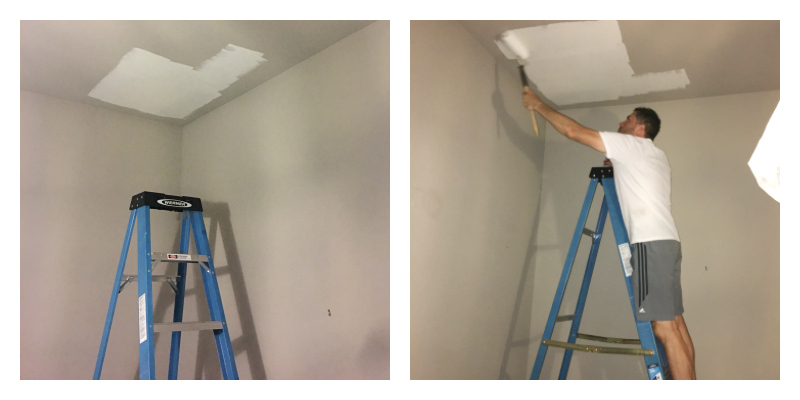 We painted the ceiling first because, well, it is painting the ceiling. My poor husband got roped into painting the first coat at 10:00 pm that evening because he was traveling last week. I would not recommend trying this at home. I managed to complete all of the cutting in and the second coat a couple of days later. Now I know why base coat painters are in high demand! 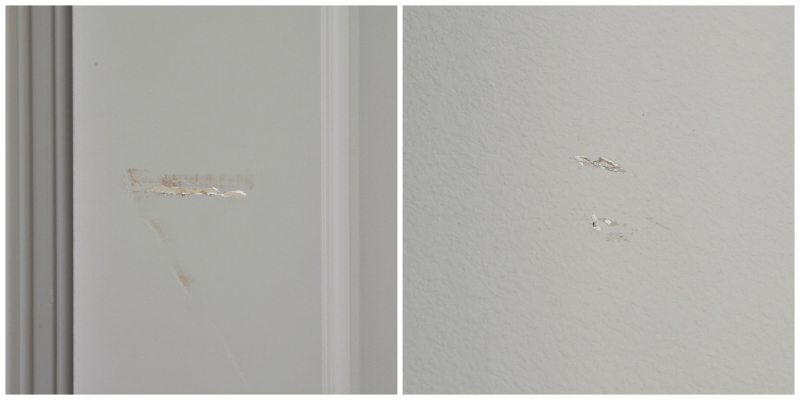 Prepare the walls properly by filling nail holes, lightly sanding imperfections, and dusting. Spend extra time carefully taping off while pressing your finger over the edge of the tape to make sure it is tight. Use extra drop cloths to protect everything you don’t want painted. Can’t have too many here. Remove electrical outlet and light plate covers as well as A/C registers. Use a paint tray liner as this will save a lot of time during clean up. Cut in with a quality angle brush. Let the roller do it’s job. Use an extension and work from top to bottom. No need to apply a lot of pressure. Touch up the molding and ceiling with a small brush if the paint bled. Wait until the walls are dry to replace the outlet and light plate covers. You will notice that I did not tape off. I will be painting the trim molding the same color as the walls in satin finish (the walls are flat), so I will do my cut in when I paint the trim. Here are a few of the spots that were in need of repair. It is important to do all of your repairs with enough time to let them dry before you paint. The ceiling has two coats and the walls have one. I can’t wait to finish the walls and move to the doors and trim! There was no need to paint the bed wall because it will be prepped for the mural soon. 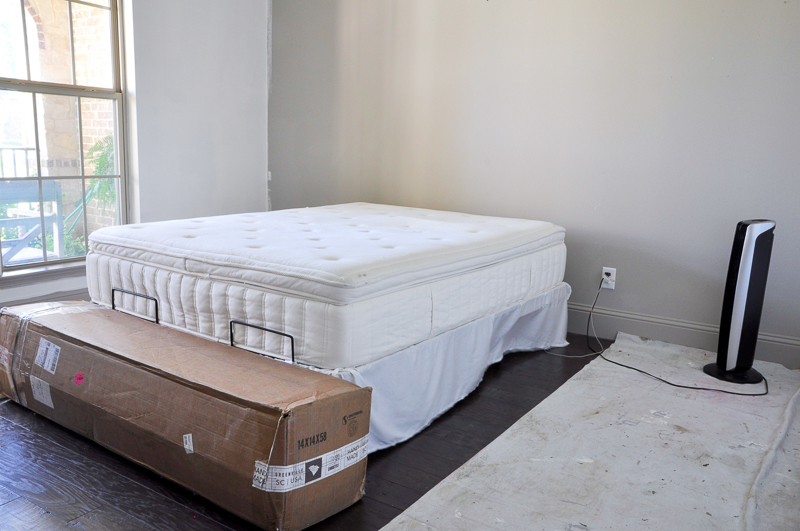 The box at the end of the bed is our new Christeli mattress! I must say, it makes it seem very real when the doorbell rings and something for the room arrives. 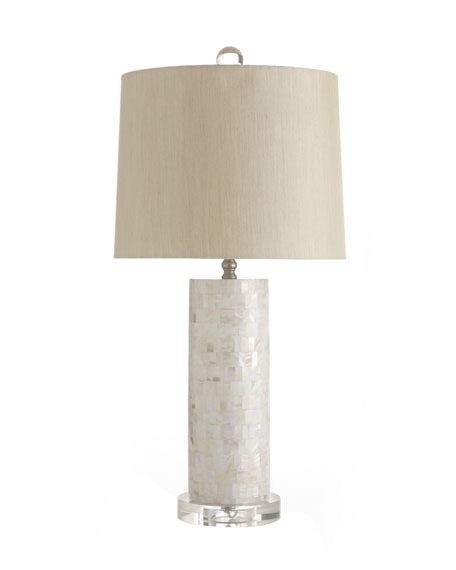 I chose to go with Christeli because I absolutely love the one we recently added in our master bedroom. You can read more about that here. I did some additional shopping this week. I made the decision to go with the lamps from my vision board. 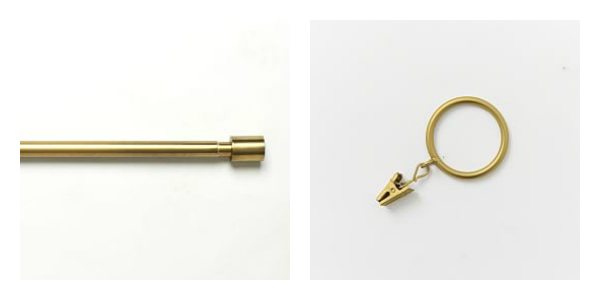 I also selected a curtain rod and rings. The hubby will be excited as he loves hanging these types of things. Or not! I’m leaning toward simple white panels, but I’d love to hear your thoughts on this. Jen, so exciting to see it coming along! I am leaning toward a Christeli mattress for our guest room soon, too. Your master bedroom sold me on it! I love your window hardware AND, with that mural, I think white panels will be PERFECT! Thank you Kelley! 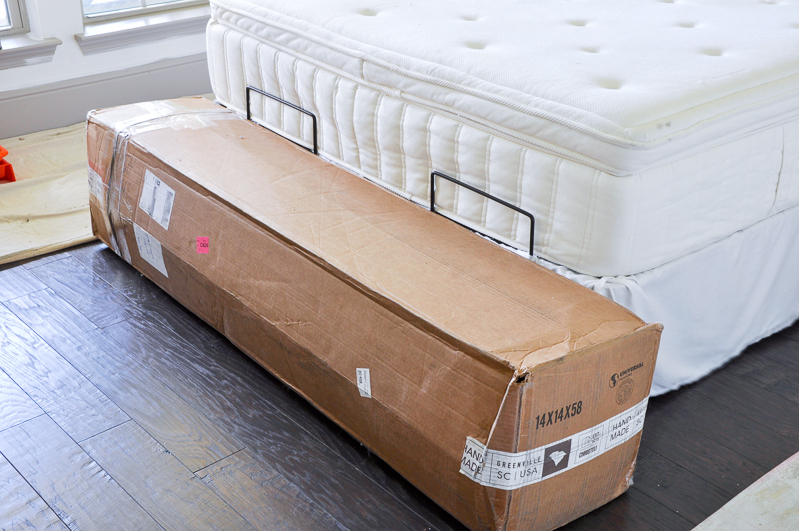 You will love Christeli mattresses! I am about to go to sleep on mine right now! Lol! I’m so glad you like the idea of white panels. I don’t want anything to compete with the wallpaper! Gorgeous, gorgeous, gorgeous! I can’t wait to see that mural go up! Oh Jen, the paint looks so fresh and clean! The lamps are a beautiful choice and I know that mural will be a showstopper! Great job on the second week! 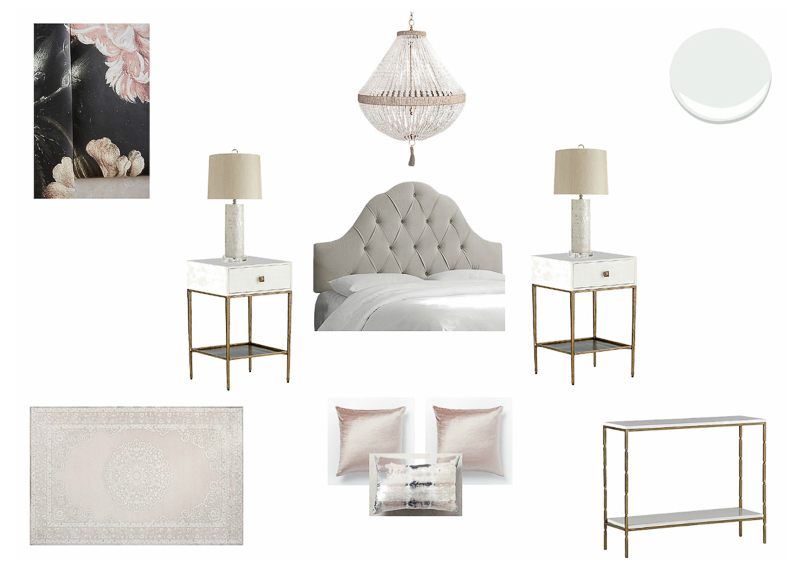 I love the soft, romantic color palette you’re going with! It will be beautiful! Thank you so much Kate!!! I’m excited to see it start to take shape! BM Simply White is my go to also!! Painting is definitely hard work!! I’m excited to see this room come together. I’ve got a similar headboard in my guest bedroom and I’m still looking for details to finish off the room! Thank you! This challenge has definitely made me much myself to get it done! And Simply White is such a great color! Jennifer it is just going to be so gorgeous. I can not even wait! I love the fresh coat of white paint and I also love the idea of the white panels! It will contrast nicely with the bold wallpaper you’ve chosen! Thanks girl! I’m loving the idea of the white panels too, just trying not to be boring!!! Lol! It’s so fun watching the entire process unfold! I’m like a kid in a candy store… look at this, now this, no this…. so fun!!! Those lamps are going to be showstoppers! And, I think with the mural the white panels will be the perfect touch! Thank you so much Jenna! I’m excited about them!!! Can’t wait to see your progress. Heading over shortly! I am doing a mural for my challenge, too. I am excited to see what you do! Oh, I’ll have to see your vision. How exciting! A fresh coat of paint makes it feel like you’re halfway there already! Looking great! Doesn’t it? It makes me want to paint the whole house! Thanks so much!!! This room is going to be so good! The crisp white is making me rethink my rethought plan to switch from white to light gray in our office. I can’t wait to see the mural wall go up! I just left your site (probably while you were typing this) and I think your plan is AMAZING! So don’t change it. 🙂 And thank you….I’m getting excited about having made a little progress. Everything you put your hands on is pure gold, so I’m sure this room will be no exception! I love the hardware you’ve picked out, and definitely chuckled over the comment about your husband. I can totally relate! Oh my goodness Oksana! Thank you. And yes, we can all relate to husbands who are slightly less excited about the decorating task we assign to them. I must say though, in truth, mine has been a saint. Thank you Bree! I am working hard to get ready for the wallpaper installation and to finish making my selections. Late nights ahead, but it’s worth it. This room makeover was long overdue. I cannot wait to see how this room finishes! Thank you for following along JW! I love, love those lamps and the gold hardware! And I’m dying to see the mural! I love the direction you’re going and can’t wait to see your progress next week! Lol! Me too Loi! I actually find painting to be therapeutic! Thanks for stopping by!